DIY Gatefold Invitation made from lustrous, champagne colored papers -- all having a subtle sheen. Embossed handmade paper wrapper and matching pearlescent invitation card, rsvp card, and envelopes. Closes with aubergine-colored taffeta ribbon. PAPER FACTS: Wrapper is made from recycled cotton rag, made by hand in India. Invite paper and envelopes are made from FSC certified paper, made without metal or foils, is recyclable, biodegradable, elemental chlorine free. These papers are made in Italy. Finished invitation measures 6-1/4x6-1/4 inches. 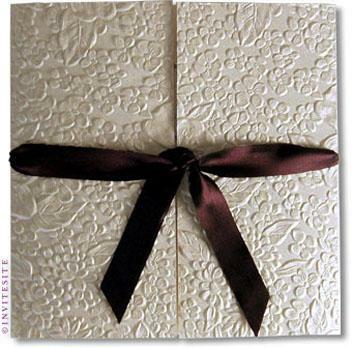 Pearlescent handmade (cotton-rag) paper wrapper, deeply embossed in a gardenia floral design. Beautiful and rich - like rustling silk. Wrapper is scored for easy folding, with die-cut slits at the sides, Ribbon threads through the wrapper. Invitation card is printed on Italian pearlescent cardstock. Enclosure cards and rsvp set tuck behind the invitation card, secured by the threaded ribbon. (See inside views). This is a really opulent invitation and perfect for a formal wedding. Invitation Sheet:Champagne Italian pearlescent cardstock. 105 lbs, substantial. Wrapper:Handmade cotton rag paper, deeply embossed. Fold-marks are scored into the wrapper and die-cut holes for the ribbons -- for easy assembly. Inner Envelope:Champagne pearlescent 70 lb square envelope. Very handsome. Outer Envelope:Softwhite matte 70 lb square envelope for mailing. Ribbon:One yard of doubleface satin 5/8" ribbon.